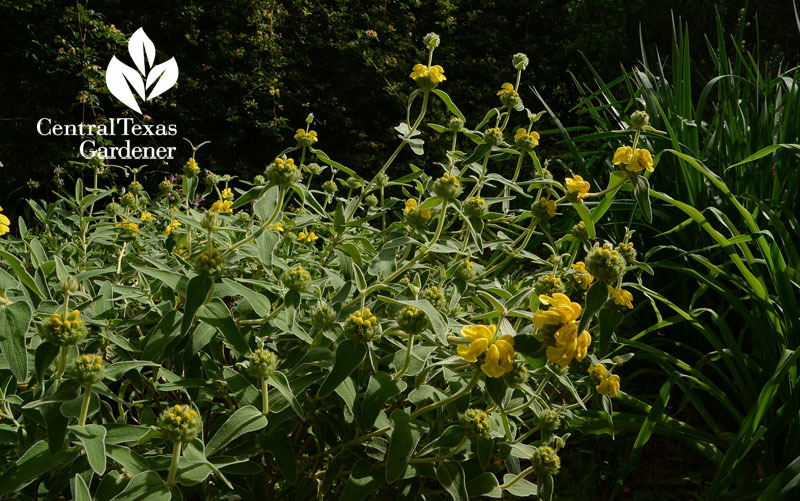 So, I never got around to moving my Jerusalem sage that’s blocking a path. If I had, I would have missed this. Winecups recently popped in beautiful burgundy, the perfect touch against velvety yellow and silver leaves. Strappy magenta-hued Byzantine gladiolus completed the textural collage. 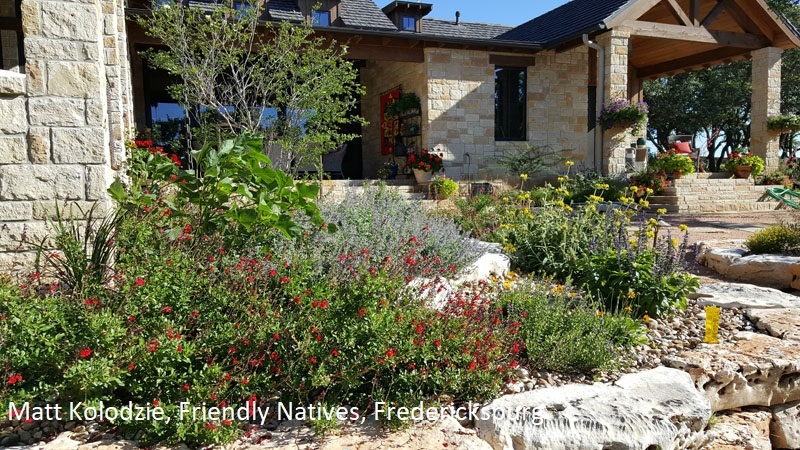 In deer country, Jerusalem sage, ‘Furman’s Red’ Salvia greggi, shrubby skullcap, ‘Jethro Tull’ coreopsis, ‘Mystic Spires’ salvia, silvery Walker’s Low Catmint and Anacacho orchid (small tree) delight our senses and the pollinators in this design by Friendly Natives in Fredericksburg. 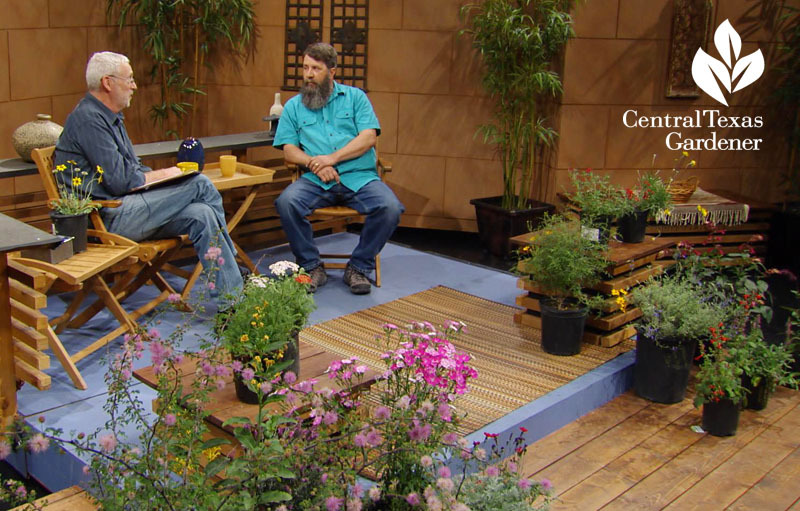 This week, Matt Kolodzie from Friendly Natives pleases the pollinators with plants that antlered nibblers resist. 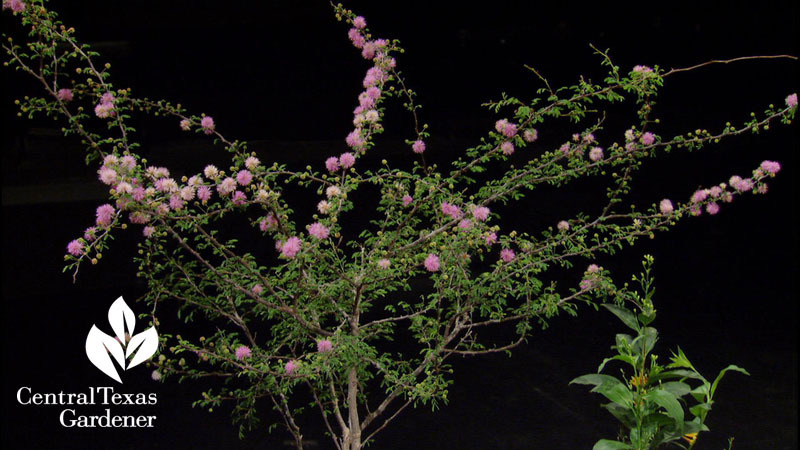 If your childhood memories include the fuzzy pink fragrant mimosa flowers of the short-lived Asian tree, Matt’s got the native one for you on rocky soil: Fragrant mimosa (Mimosa borealis). 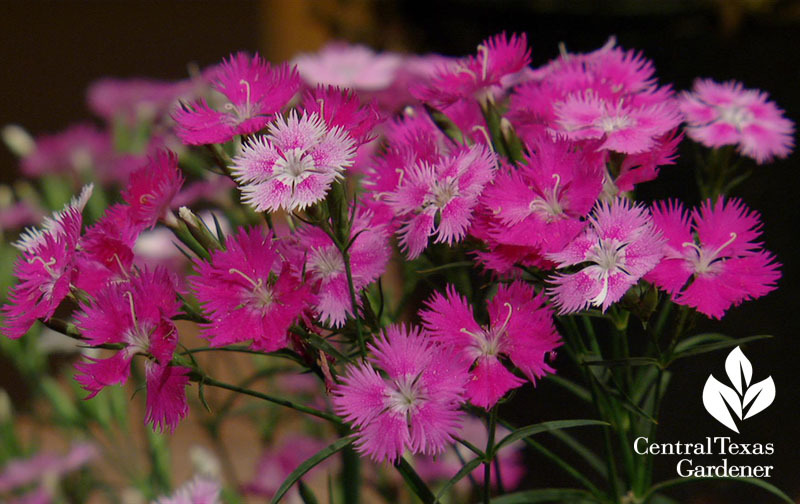 In the ground or in porch containers, edible and fragrant ‘First Love’ dianthus promises a long-lasting love affair. Recently, I saw butterflies all over dianthus! 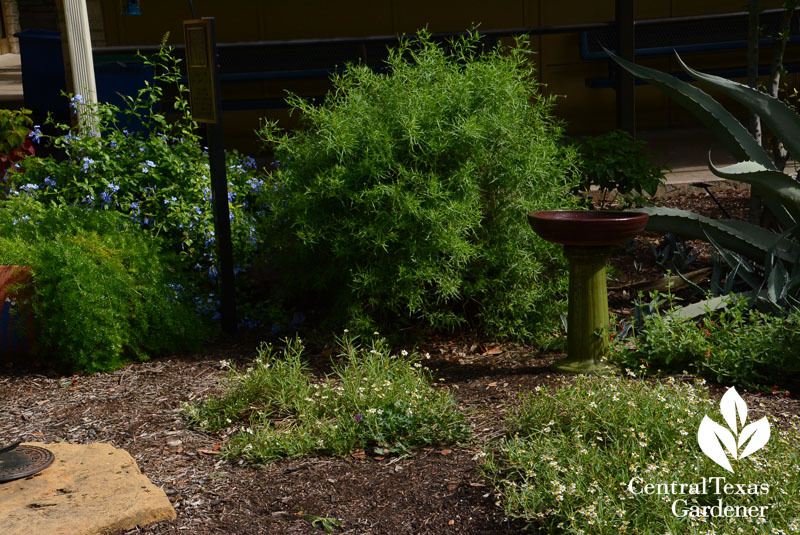 Salvias are always sure bets to beat the deer, including the meadow sages, like ‘May Night’. 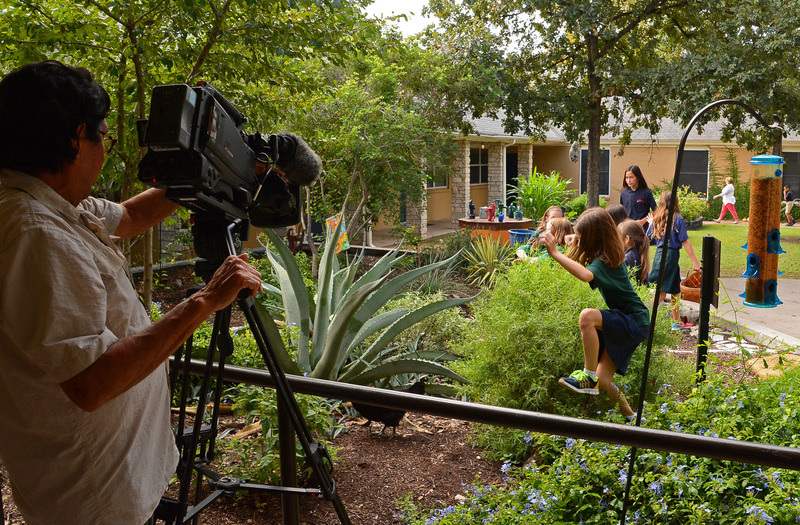 In a garden we taped last week, Salvia greggi and ‘May Night’ attract bees, butterflies and hummingbirds. 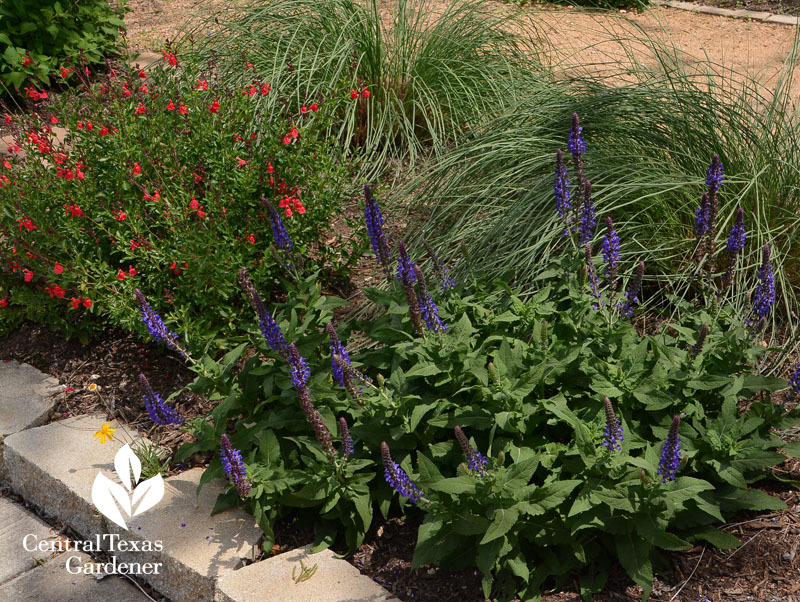 Lindheimer muhly grass offers sprawling, tendril-like contrast and towering fall seedheads. 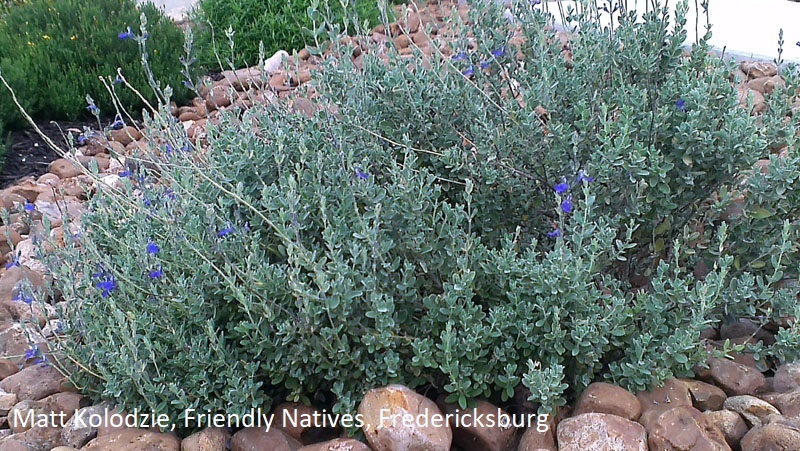 I positively adore gray shrub sage (Salvia chamaedryoides) but in my Blackland Prairie garden, I haven’t found the absolutely perfect spot for it. 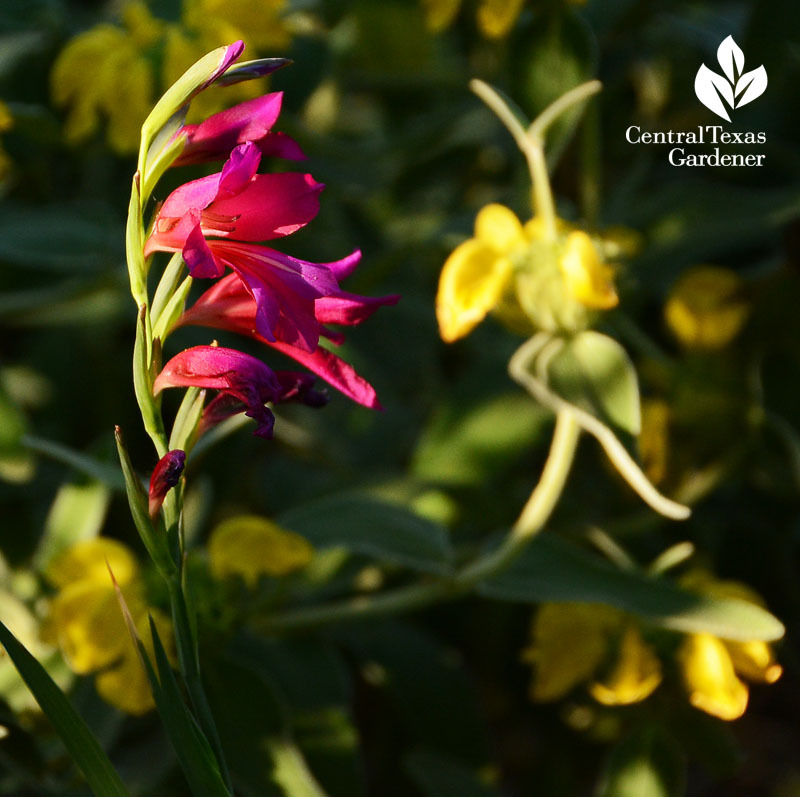 In total sun, dry, well-drained or rocky soil, you’ve got a winner. 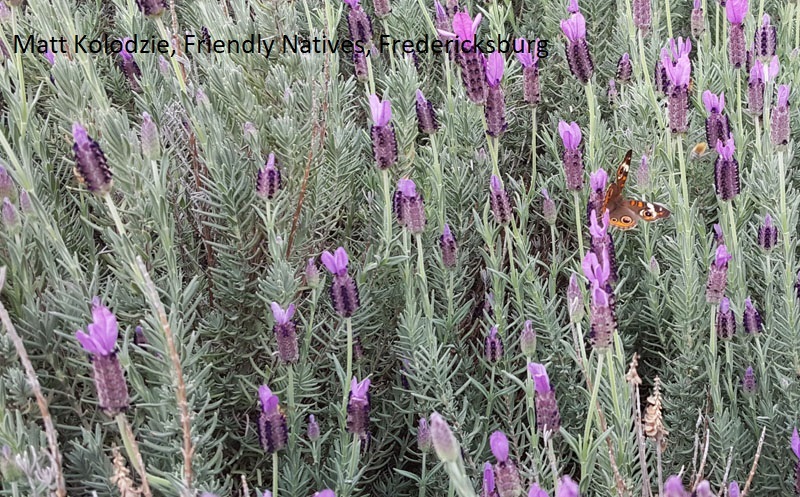 Spanish lavender is one of the easiest to grow for all of us lavender-lovers, but it wants good drainage and sun, too. Butterflies, including Buckeye, are as delightful as the flowers. 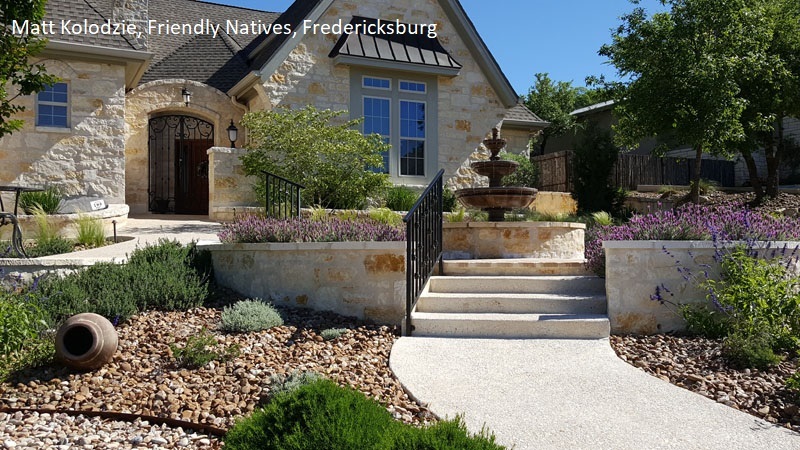 In this Friendly Natives design, Matt paired it with gray santolina, salvias, wall germander and more. Well, there is SO much more, so just watch now! 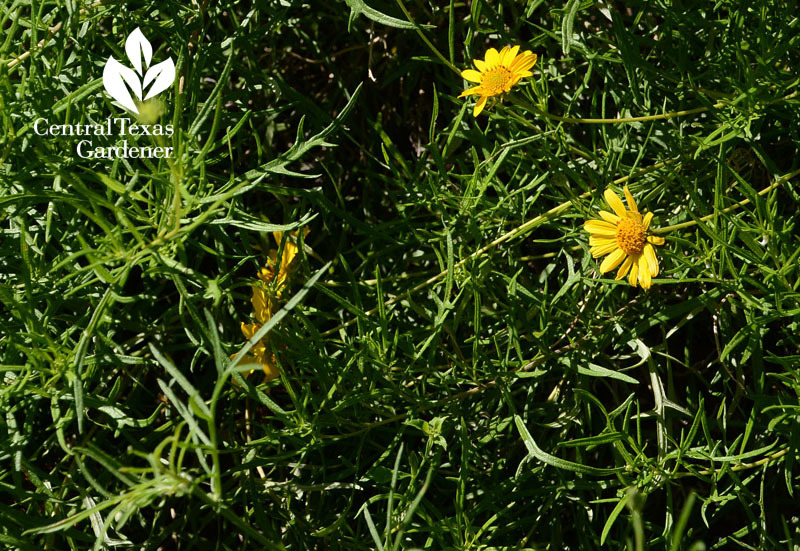 Deer bypass native perennial skeleton-leaf goldeneye, too, while pollinators head over to its sporadic spring-to-fall daisy-like golden-yellow buttons. 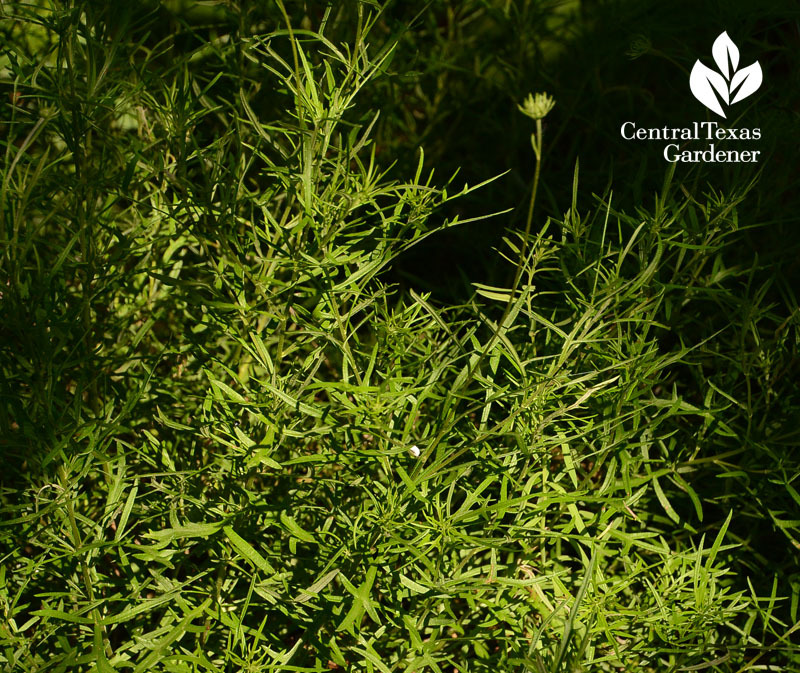 From afar, this very drought-tough perennial looks almost “ferny” with its thread-like leaves. I trimmed mine quite a bit in March (not to the ground) to freshen it up and fluff it out. Mine gets a little morning sun with blasts in the afternoon, though it can take full sun. Flower buds should be open any day now! Get Daphne’s tips on growing skeleton-leaf goldeneye! 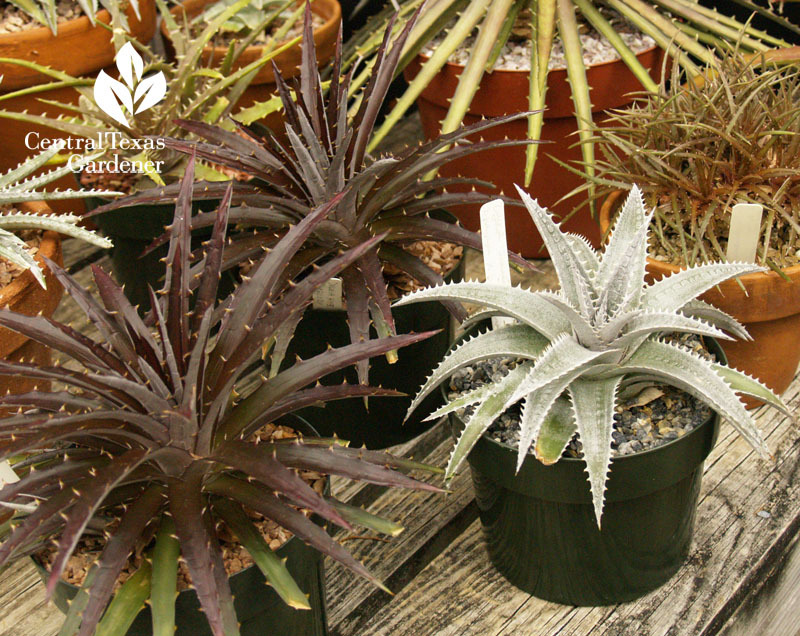 Dyckias, terrestrial bromeliads from South America, intrigue with spiky leaves in countless colors. 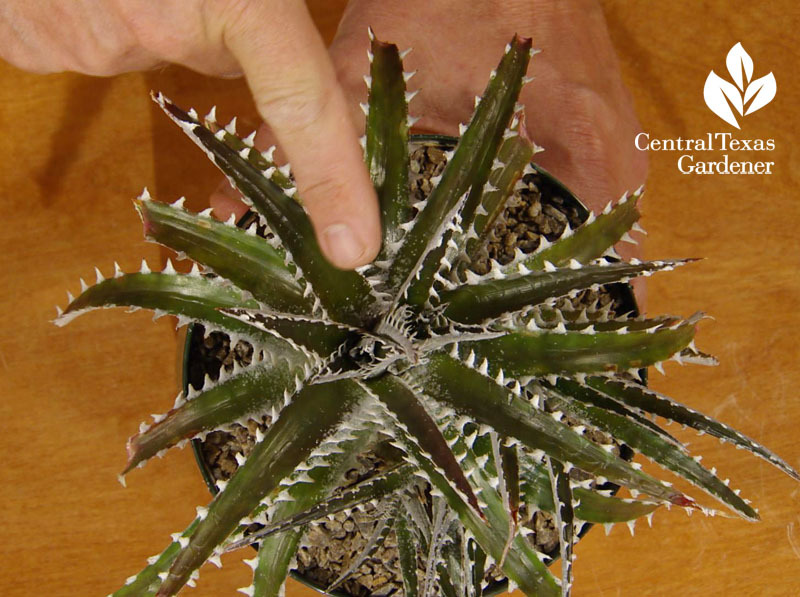 They produce pups or offsets, like agaves, at the base of the plant. 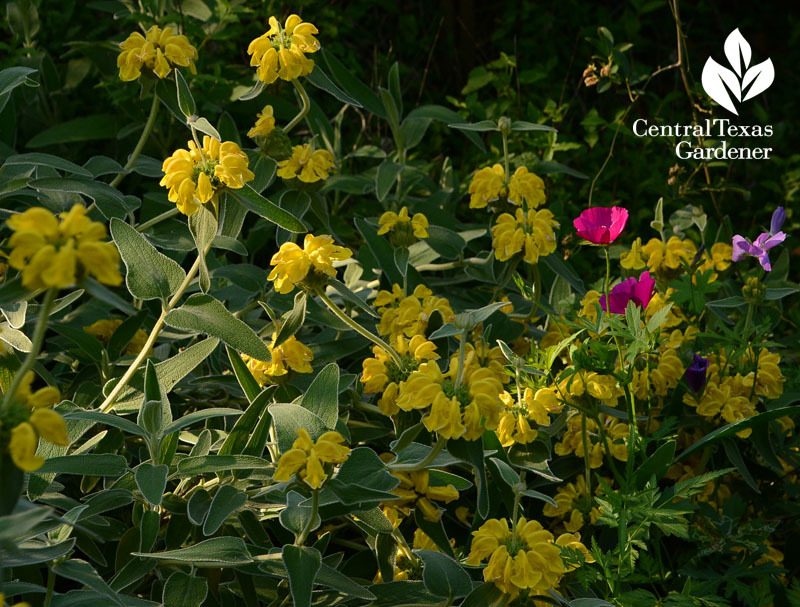 They also divide in the center into two plants. 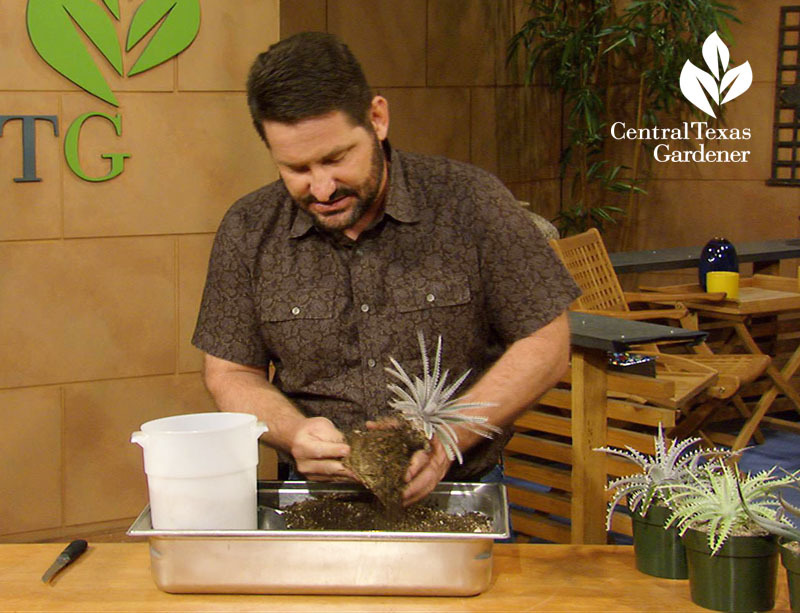 See how Jeff Pavlat from the Austin Cactus & Succulent Society plucks offsets and carves the plant right down the middle to multiply his (and your) collection! 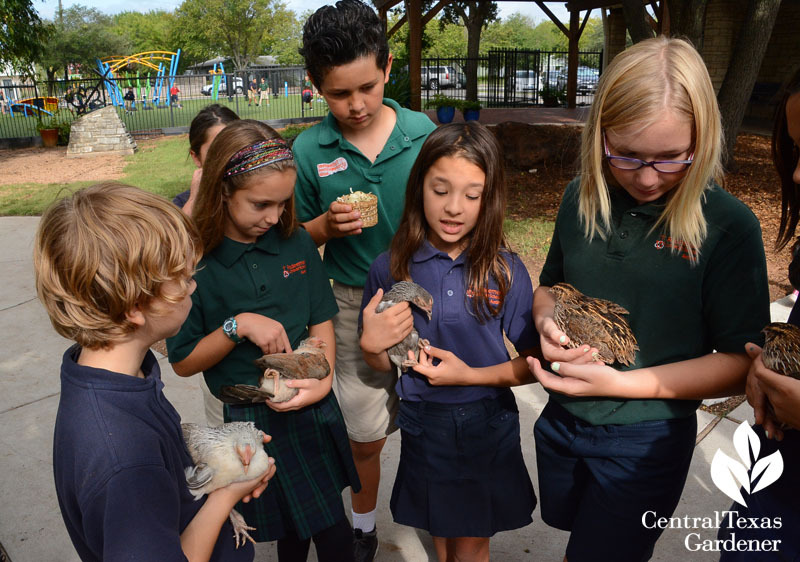 On tour at Redeemer Lutheran School, students go wild about science lessons outdoors in a wildlife habitat, vegetable gardens and a mini-farmyard. 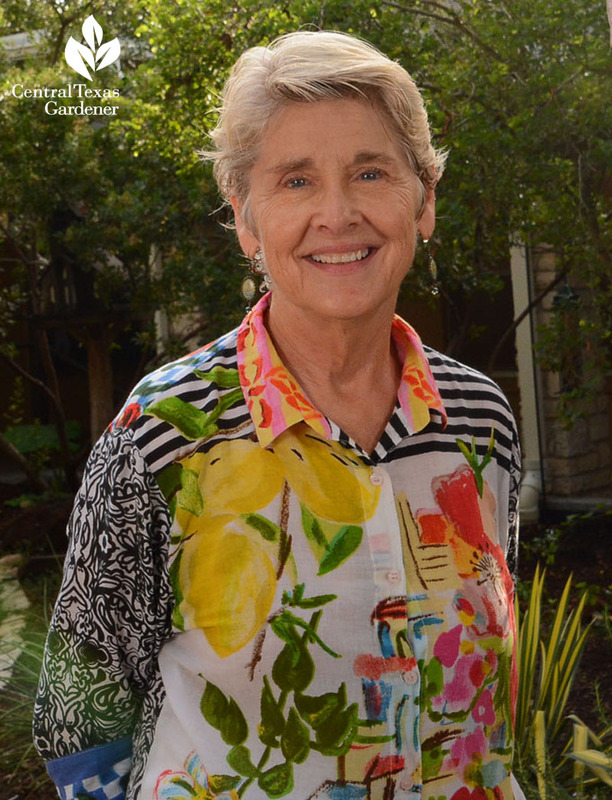 It all started about 15 years ago when science teacher Danna Keyburn started a Junior Master Gardener program. 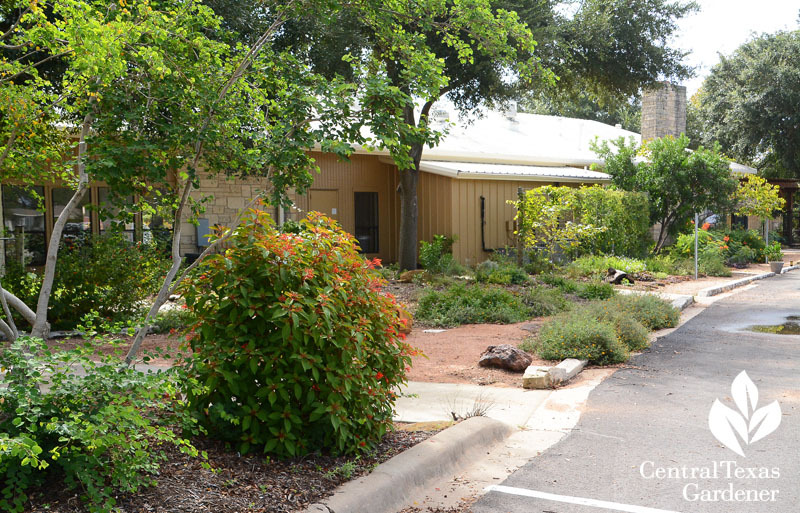 Then, she connected with the National Wildlife Federation’s school habitat program and went after grants. 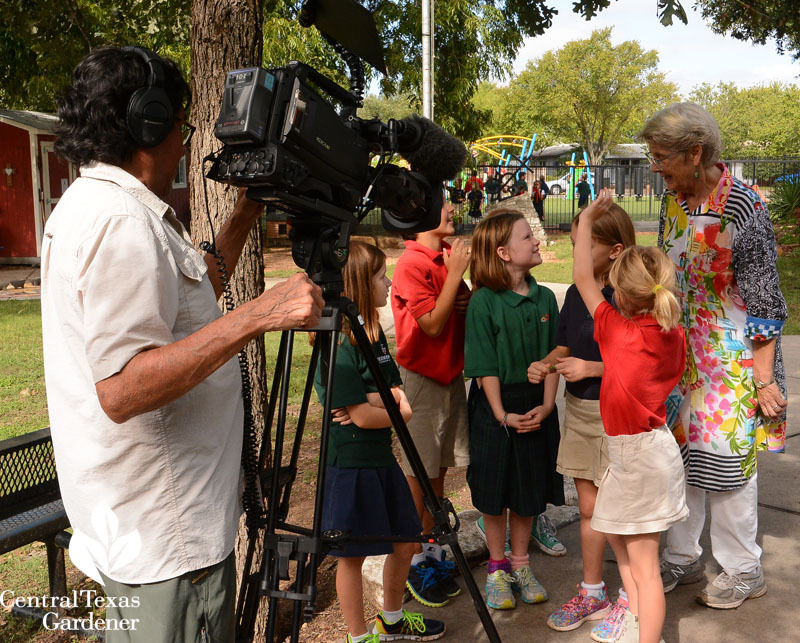 Every day, students observe seasonal cycles from caterpillar to butterfly and how plants and creatures interact. 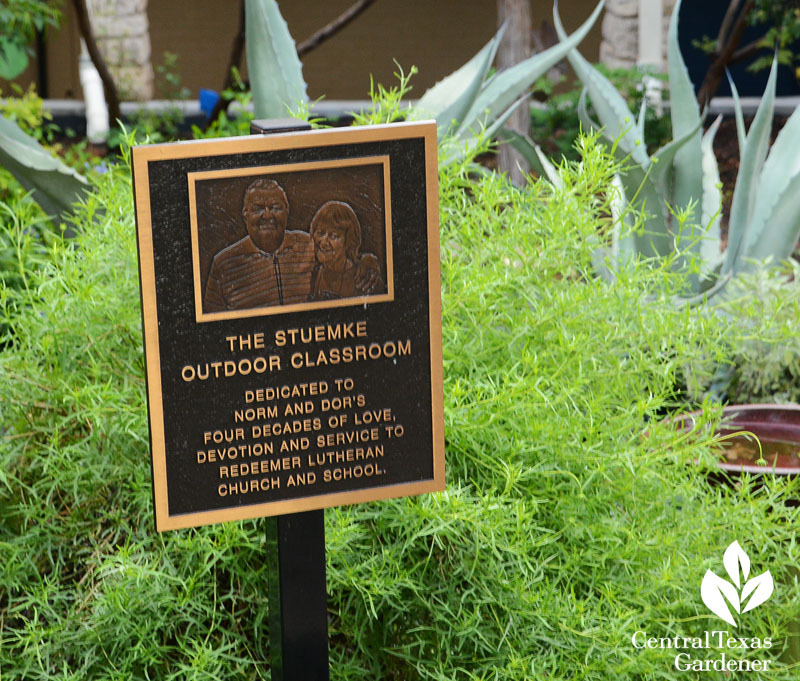 Long-time former principal Norm Stuemke enthusiastically embraced the outdoor classroom—the garden rainbow rooms—that students consider one of their favorite playgrounds. 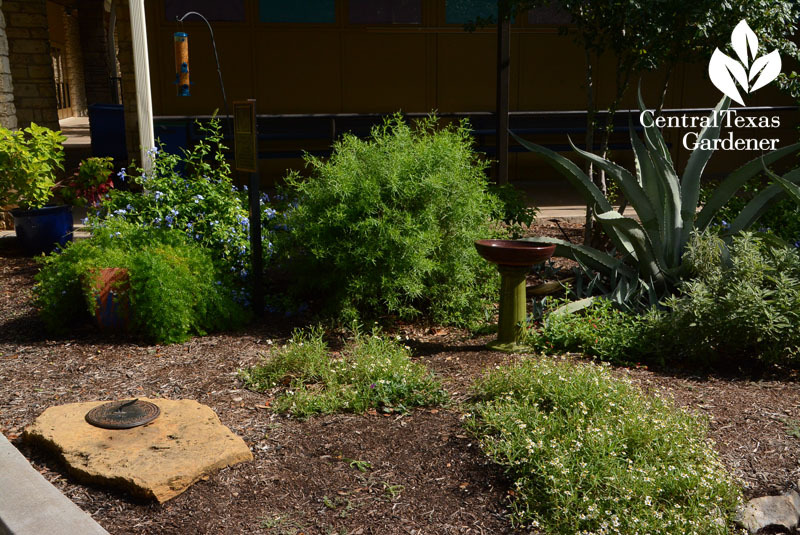 Students also learn what plants work together to provide nectar, pollen and seeds for wildlife. 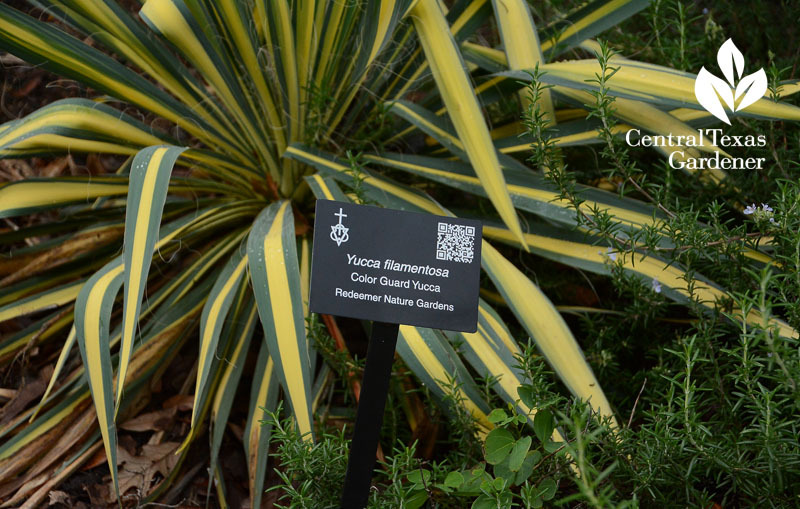 A Redeemer Girl Scout developed QR codes so that students can identify, photograph and write stories about the garden’s plants. 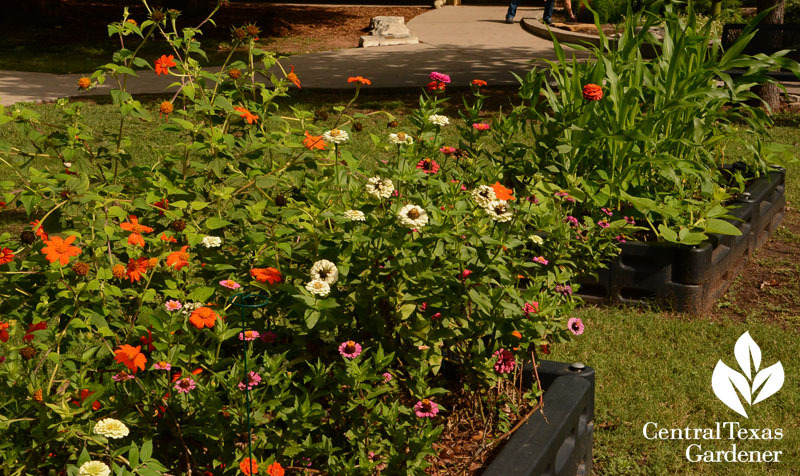 Students plant flowers for pollinators, like warm weather zinnias and Mexican sunflower (Tithonia), and food they can eat, too. 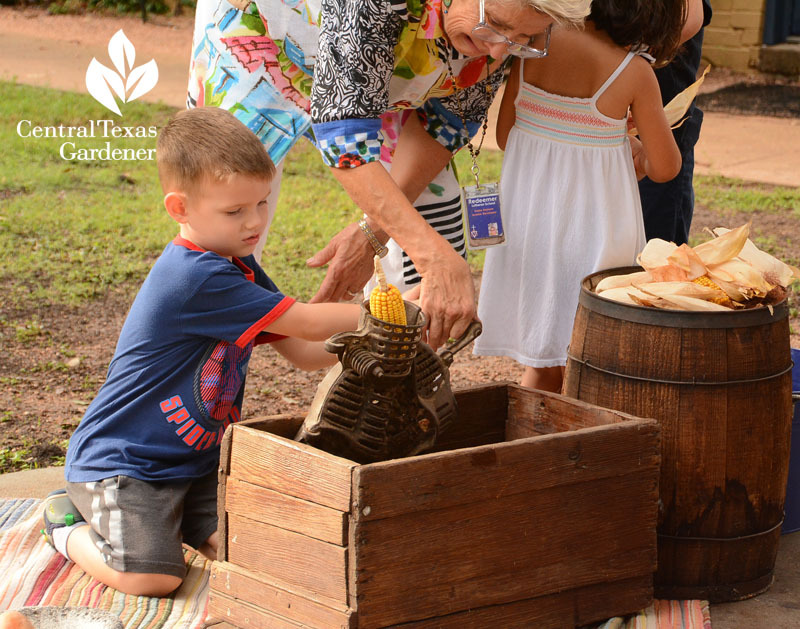 A three sisters garden of corn, beans and squash was in full swing on our visit. 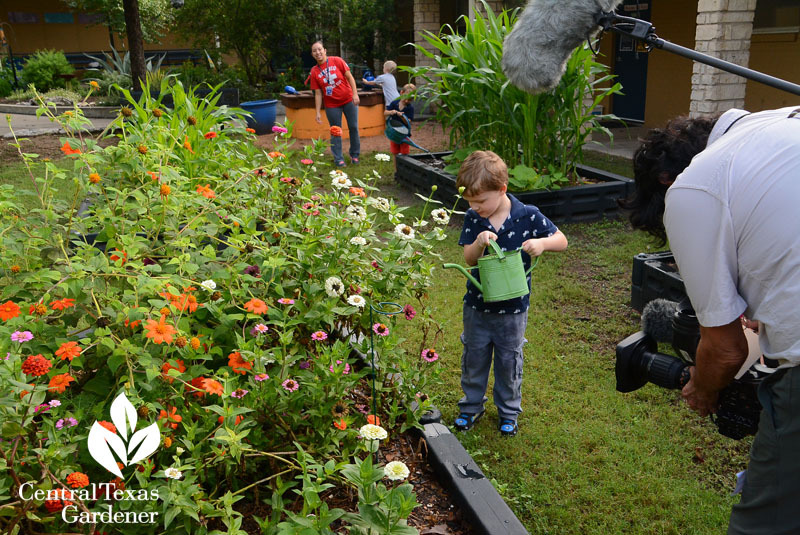 Watering can be a chore for us after work, but for children, this is fun, especially if you pump it yourself! 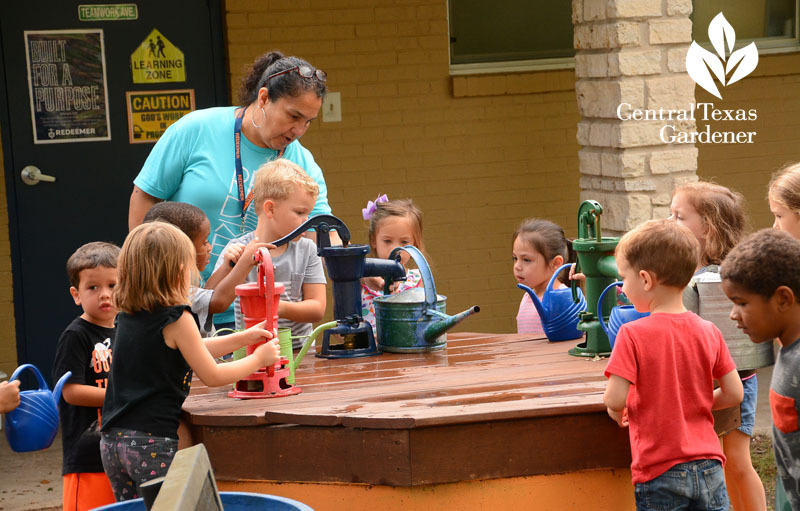 Science and nurturing join hands at the water pump station. 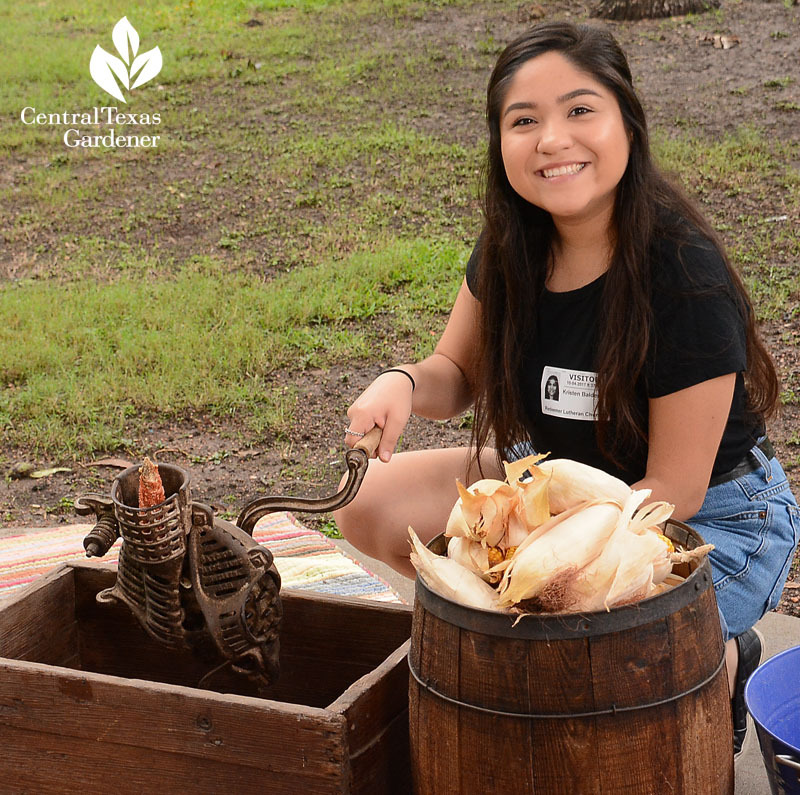 Grinding corn cobs is the ultimate connection to how food turns into another kind of food! Our wonderful intern Kristen Balderas couldn’t resist giving this a try, and I wanted to join her! 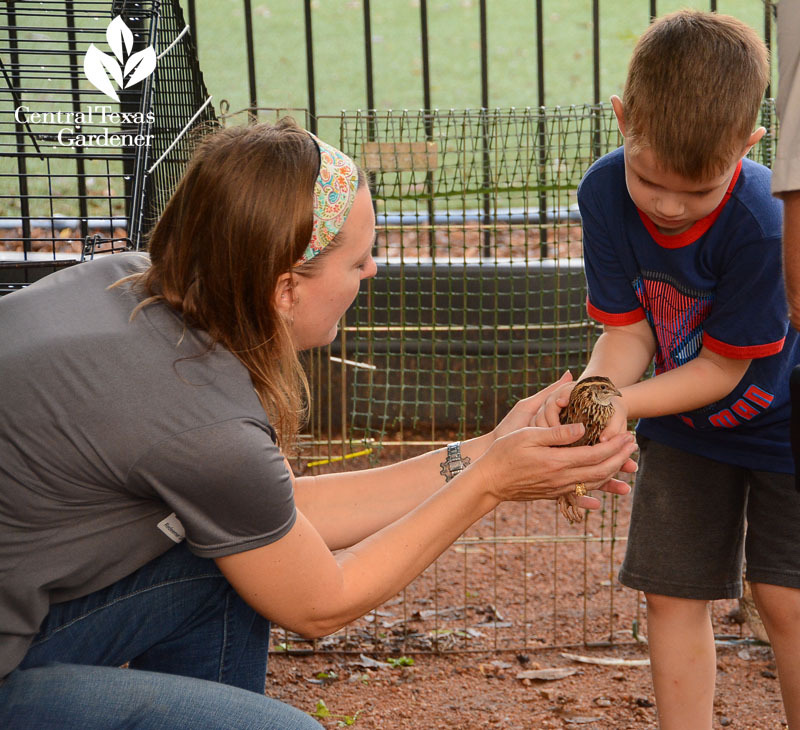 To add the irresistible element for any kid (or adult), Redeemer volunteers built a “barnyard” for chickens, quails, and even turkeys. I’ve never seen such cuddle love when students brought them out for us. 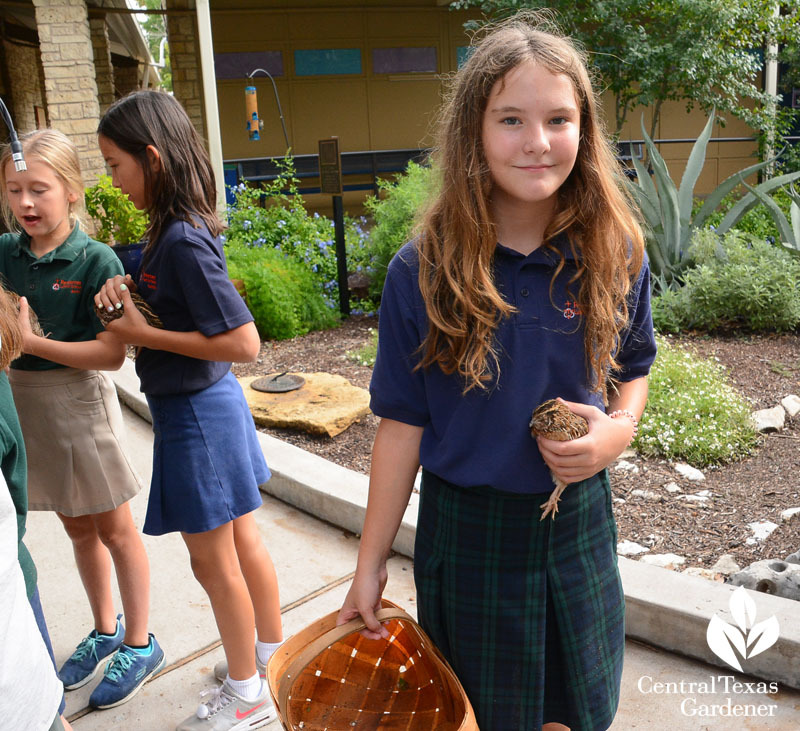 One child is holding quail eggs they collected! 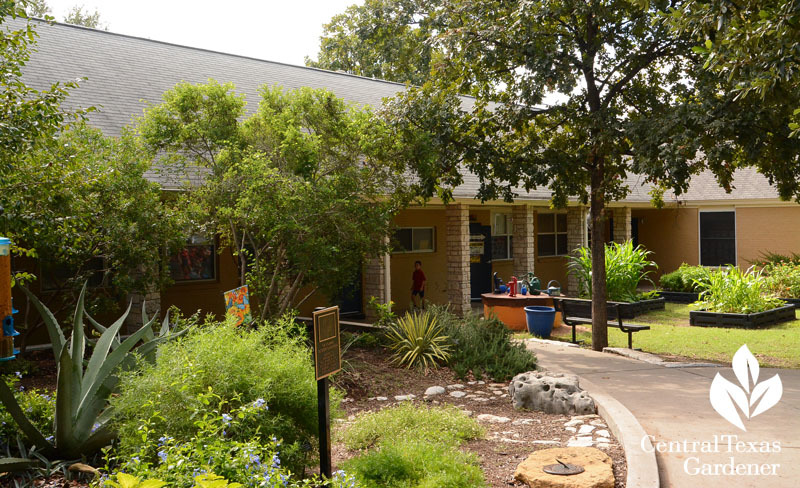 And what a kick to run into our frequent CTG guest and consultant, Wizzie Brown, entomologist at Travis County Extension, teaching children about animals (and also insects). 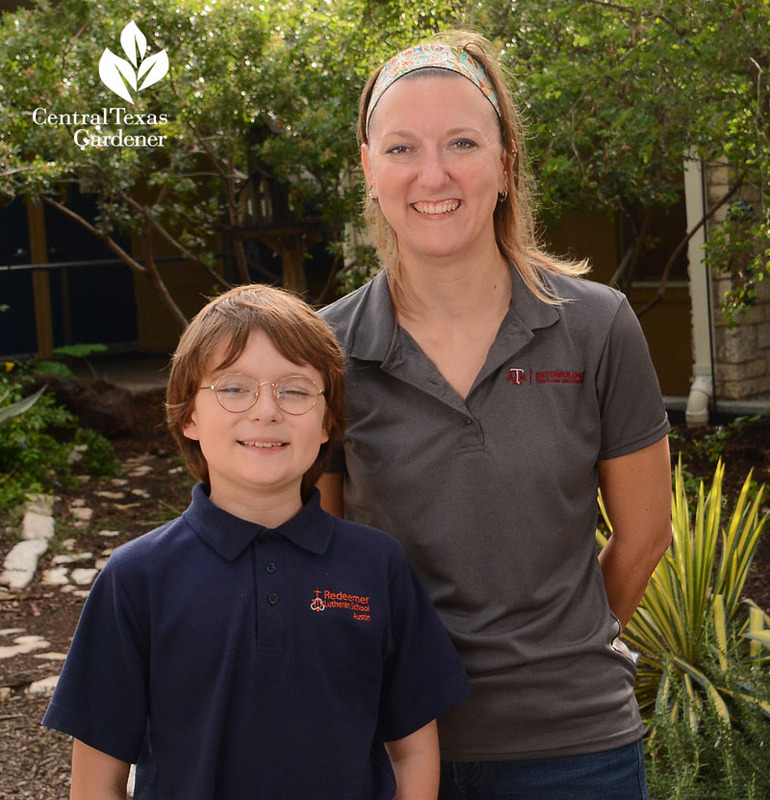 Her charming son’s a Redeemer student who’s got your tip for grasshopper control. 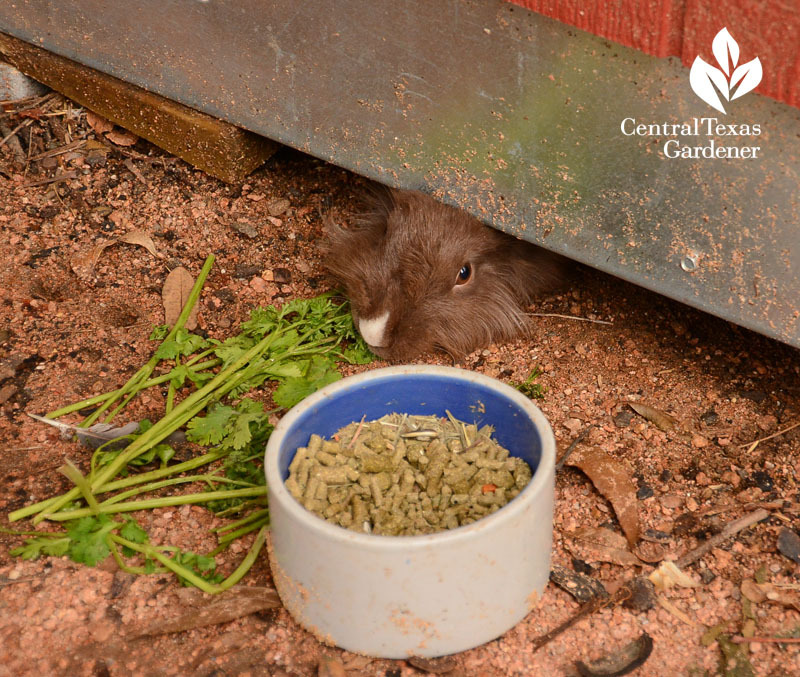 BUT, a big deal during our visit was a student trying hard to entice their bunny from under the cute shed. And once the students were back in class, I kept an eye on the shed as Ed and team packed up. 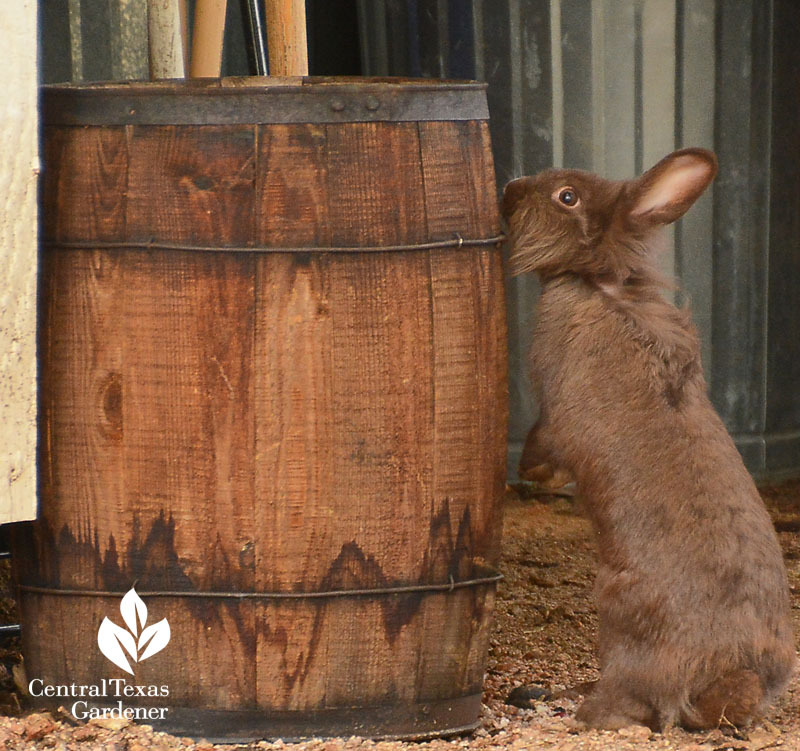 I’d promised the children I’d get a picture of the bunny. Bingo! 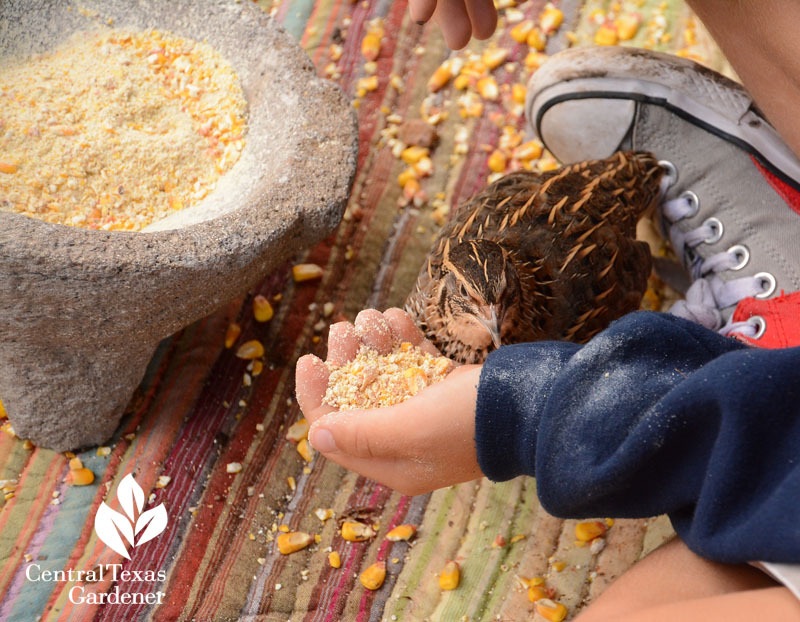 Danna recommends these resources for schools: National Gardening Association, the National Wildlife Federation, and Texas Parks & Wildlife Project WILD.